Yesterday I was out in the yard with the boy, and I heard the prettiest little song. It took a while, but I finally traced it - a tiny wren flitting from tree to tree. I'm guessing that it was a house wren. I don't know if it's on migration or settling here, but I hope it hangs around. I think I hear him out there now. 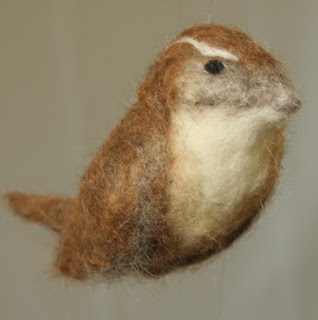 I've been meaning to make a Carolina Wren, and I finally have the colors needed, so here's one. They have the funniest song: TEA KETTLE TEA KETTLE TEA KETTLE TEA! Really high pitched and loud. On another note, I saw that robins are making a nest in my hedge. That's exciting! And I won't have to trim that section till they're done nesting. Thanks, robins! Right now we have goldfinches, pileated woodpeckers, downy woodpeckers at out feeder. We filled up the bird bath and it has become a Robin spa again. Robins really love to bathe !I live in the southern part of the state near New Haven. Have been seeing lots of great blue herons in CT since late winter. We really seem to be having a good year for bird watching this year. Your sparrow is adorable--as are all of your sweet birds.